REVIEW - Please, Don't Touch Anything - Use a Potion! Please, Don’t Touch anything, a game by Russian developer Four Quarters, is a difficult game to review given that you don’t want to ruin some of the surprises in the game. It was originally released in March but has been updated recently, adding six more endings to the game. The game is both simple and complicated. Sometimes it’s easy, other times it’s punishing. Sometimes it will make you laugh, other times it will make you want to tear you hair out and cry tears of pure rage. The game is a real enigma. The game is also quite simply brilliant. 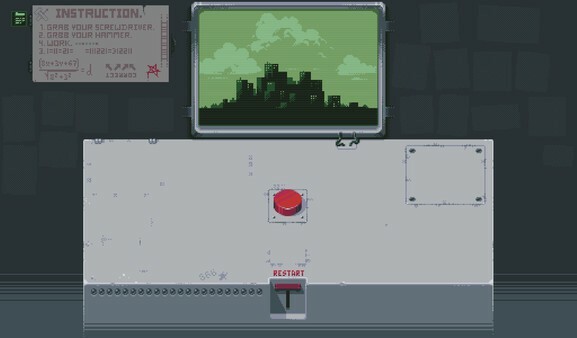 The game has a simple premise – a friend/colleague has gone for a toilet break, leaving you alone with a device that has a big red button on it and a screen displaying a city. His only request is that you don’t touch anything, a fairly simple request. Of course you won’t touch anything, right? Of course not! First thing you’ll do is touch the red button. Then a switch will appear on the device. You have to flick that, I mean, who wouldn’t? So you flick the switch. Then you press the button again… And a countdown starts on the device, resulting in the city on the screen being blown to pieces. Oops. 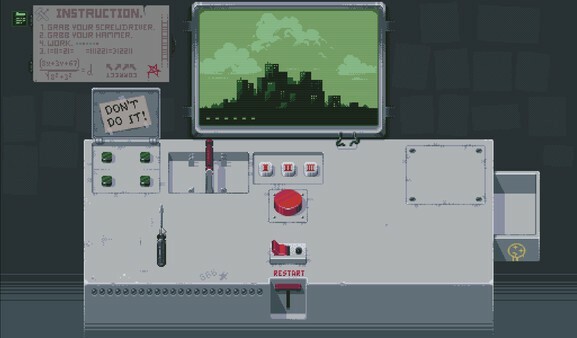 Then you start again, but with a little poster appearing on the wall showing that you have unlocked one of the twenty two possible outcomes in the game. Some of the endings of the game are easy to unlock and some are so perplexing they could leave you scratching your head for hours. The game is very fair though – there are clues hidden throughout the game to solve every puzzle, some in plain sight while others very obscure. Sometimes the solution doesn’t require a clue at all – just you taking your frustration out on the device by using one of the two tools given to you (which will also help you towards unlocking two of the more bizarre endings of the game). The endings really are a treat though, the city the victim of alien attacks or even a visit to the future – they are all entertaining and many littered with different references to pop culture; by the end though you may start feeling a little sympathy for the city that is falling victim to your constant meddling. Despite its simple nature things get complicated fast. There’ll be buttons and levers appearing in front of you requiring baffling combinations of inputs presses to work, obscure references to historical figures that will require googling before you realise what they actually represent or even replicating the background music; the game expects so much from you and gives you so little to work it out. Yet it gives you SOMETHING, and despite how little or obscure that something is when you finally work out that puzzle that you’ve been stuck on for the last half hour you’ll be leaping with joy, ecstatic that you have another poster on your wall representing an unlocked ending. Then you’ll hit the restart switch and press that big red button again. It’s so demanding, yet so satisfying – there’s a real drive to press on and unlock everything in the game. There are times that you’ll want to walk away but deep down you know the solution is right in front of you. The graphics are simple but effective – it’s very reminiscent of Papers Please, a game one of the possible endings gives a nod to showing the developer’s appreciation and possible inspiration of the title. The city is shown on a 2-bit display reminiscent of the Gameboy. The designs of the posters are a nice touch with references to movies, TV shows and videogames, adding a bit of character to the design. The game never tries too hard graphically, but the nature of the game doesn’t really demand it either. The music in the game is well integrated and a treat on the ears, the chip-tune themes playing out ominous tunes as you’re busy ‘not touching anything’. Depending on the situation or ending that’s playing out the music will change, but it’s always of a high quality and fits the mood of the game. Please, Don’t Touch Anything is a great game. For a game that’s so minimalistic it’s packed with character, great music and well crafted and intelligent puzzles. The game will last you a good few hours and comes at a low price point – I managed to get all the endings in roughly three hours. You’ll constantly surprised you with some really bizzare and interesting outcomes, and it’s a real credit to the small development team that they have made something such a simple premise into such an enjoyable game.